I’ve been having some fun embellishing tags and finding ways to use them to make practical items a little nicer looking. 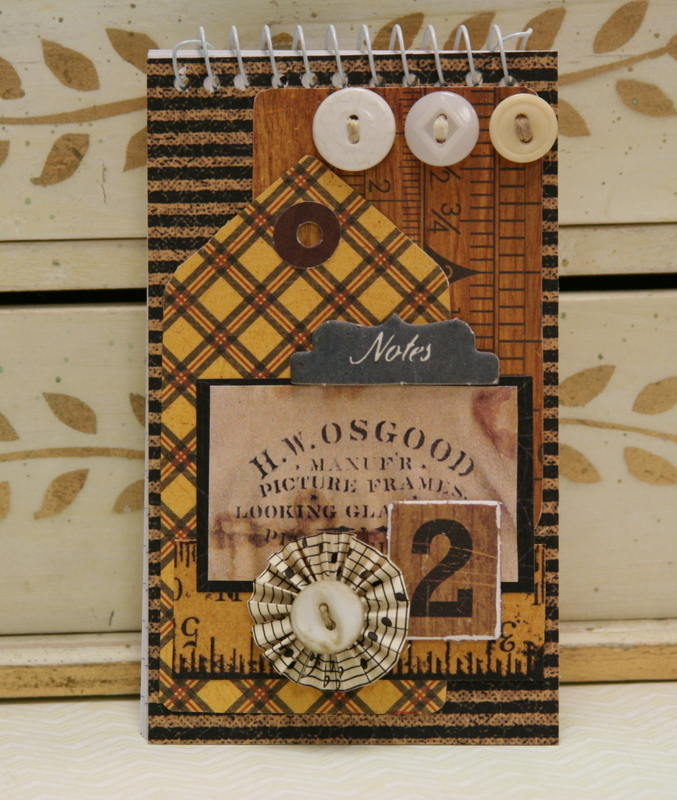 I added these tags to some small notebooks and I just love how they turned out : ) They have some great vintage images on them from the Graphics Fairy and layers of chipboard and buttons other fun trims. What a nice place to store notes right???? So we had ourselves a little play date at the shop and as usual….Jane brought in goodies to share. Pretty vintage buttons and trim and feathers! 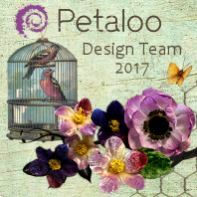 I’ll have to admit I’ve never actually used feathers on a project before. 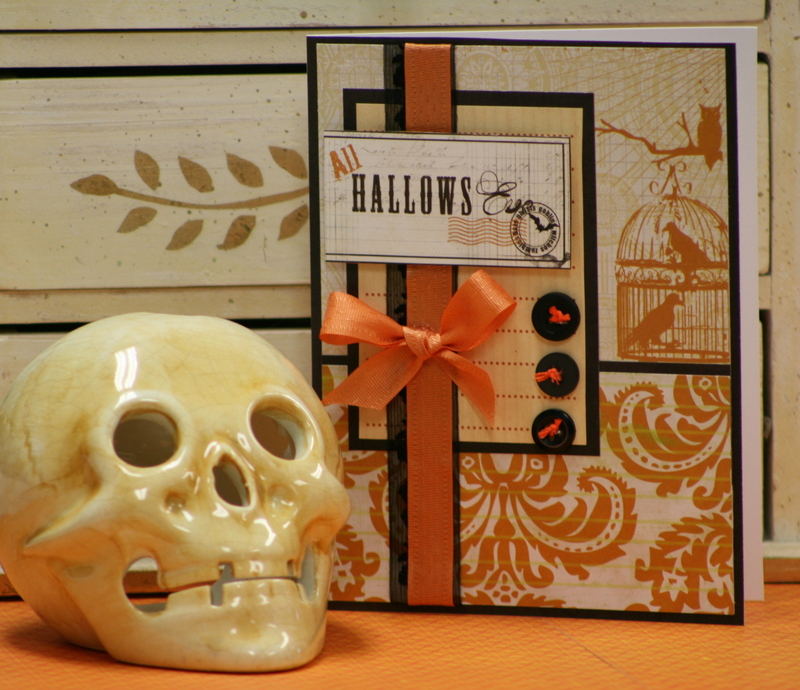 Amazingly they coordinated with my Halloween project so well : ) Thanks Jane for sharing!!! I started this collage by painting and inking the lid to a paper mache box. I added some fun border paper from Pink Paislee that I dry brushed with white paint. Next came some awesome images from Graphics Fairy. The text in the background is an old poem image that I dry brushed then inked with marmalade Distress Ink. The rather stern looking woman was part of a larger image so I clipped her out. She was dry brushed also, then I gave her a little witch hat for fun. 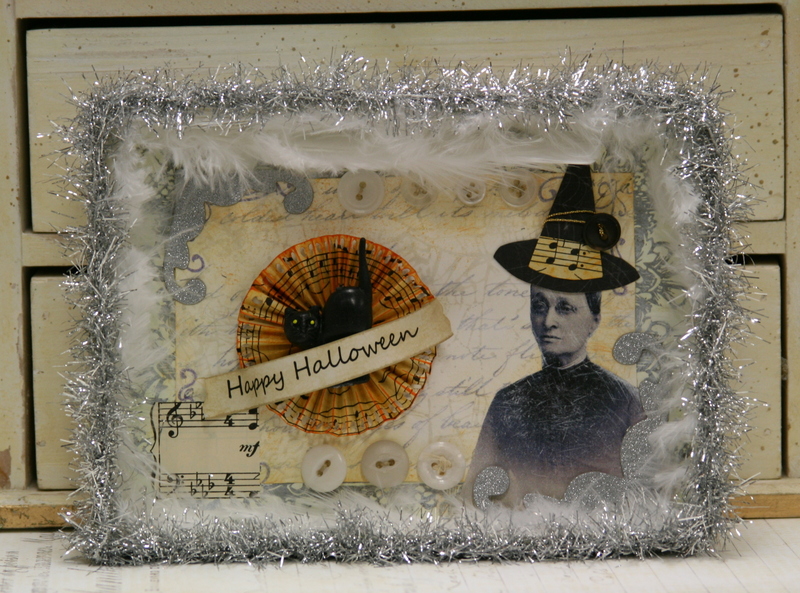 A little dimensional embellishment made from old sheet music ( gift from friend Carol thank you) that was inked to match then I added the cute black cat and Halloween sentiment. A few pieces of sparkly chipboard and several vintage buttons finish off the back of the collage then I added some tinsel trim the awesome white feathers! Here is an example of how you can alter these tags…. 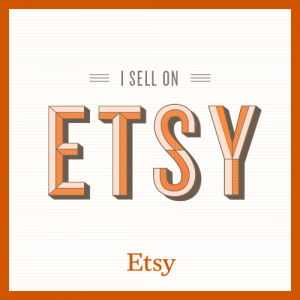 I chose the blue floral tag and added a beautiful vintage graphic image that you can easily find on Graphics Fairy….just follow the link on the right…she has images that a perfect for any project! I inked the layers heavily with Old Paper Distress Ink. 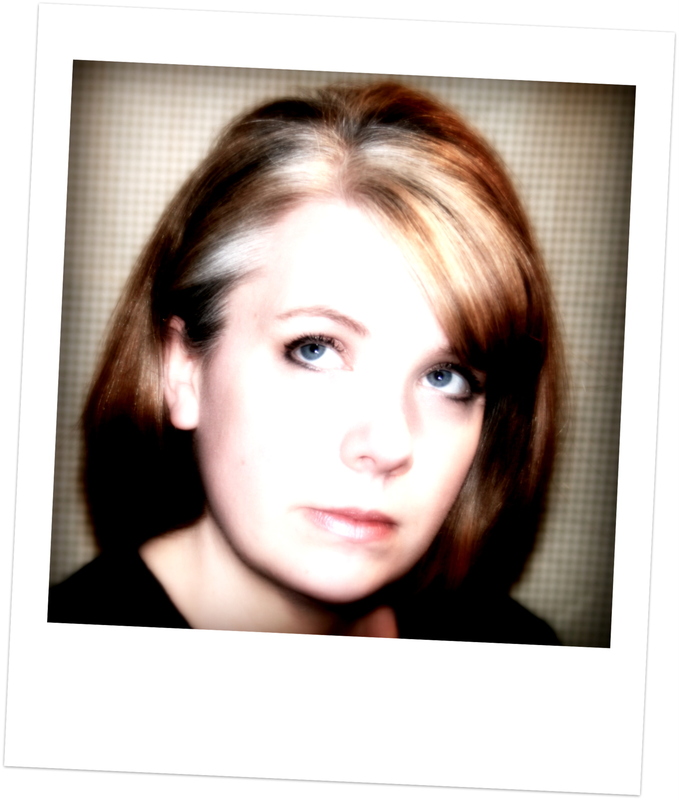 Then I added a complimentary blue stripe with a lovely silhouette image also from Graphics Fairy. 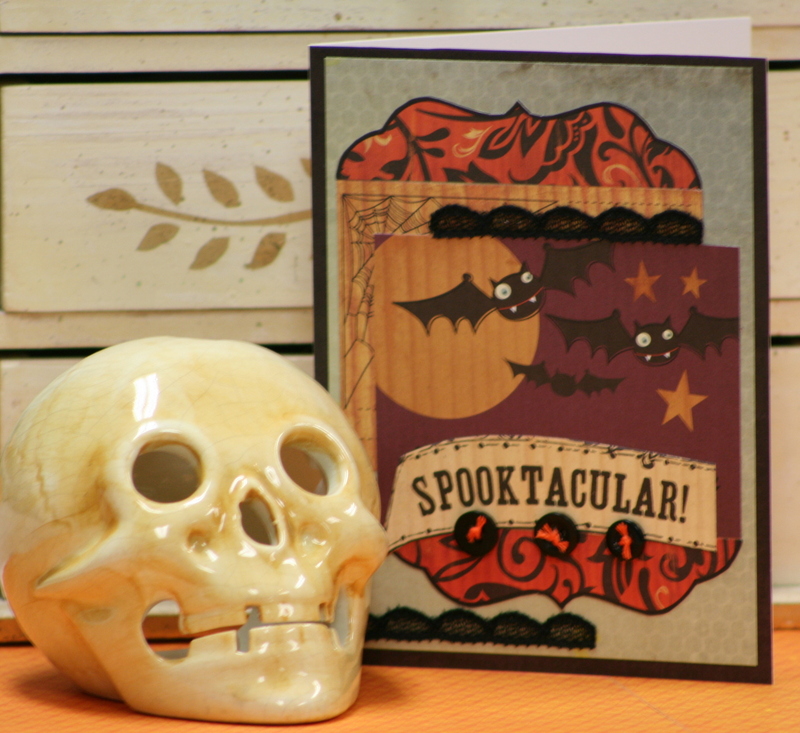 I topped it off with a chipboard frame that I painted and glittered, and several creme colored buttons. There is a pretty flourish metal charm in the corner. Last but not least…I created a fringe of crystal pendants and a layer of sweet blue paper roses. Having a double layer of cardstock is critical when adding so many embellishments so your tags will hold their shape and be sturdy. I choose a nice variety of papers with small prints to top these lovely tags so you can alter away and not loose the pattern. 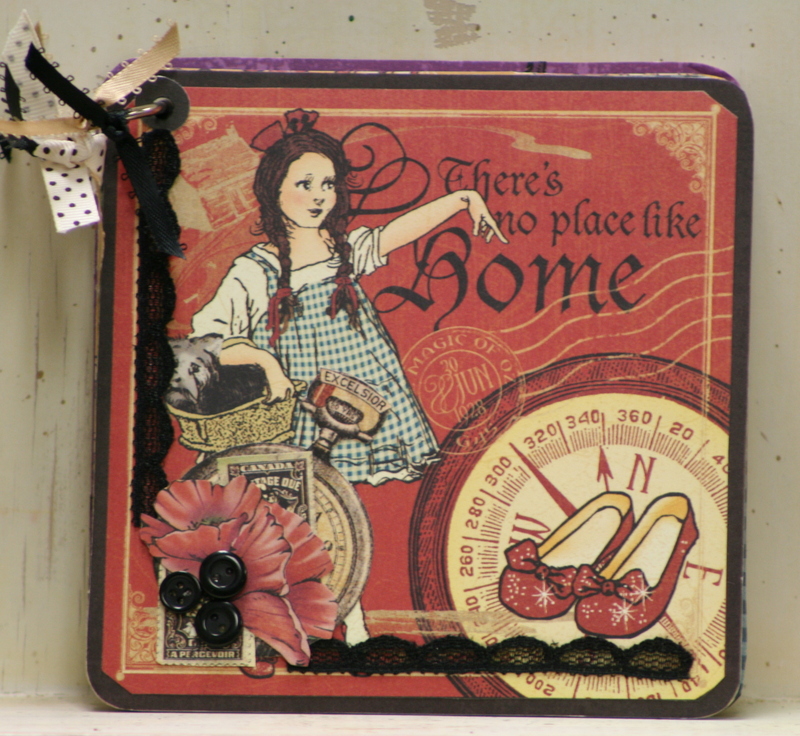 The Wizard of Oz Line by Graphic 45 is so amazing I had to use it in a mini…despite how I feel about the movie. I admit that I have really never liked the movie. Mostly because of the creepy scary flying monkeys. Okay…that’s the only reason…lol. 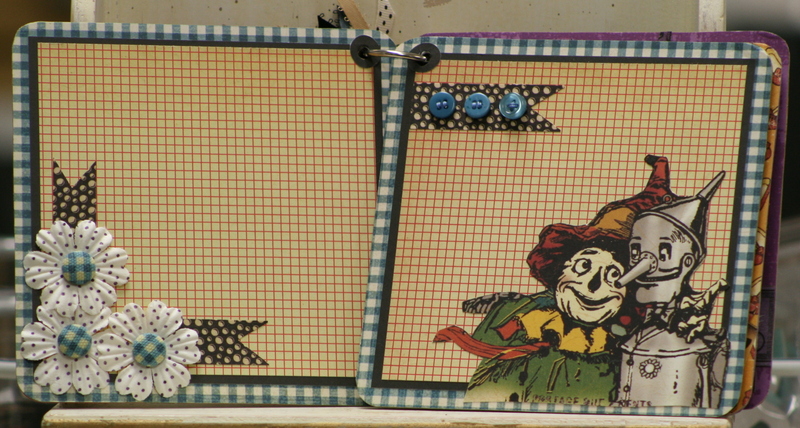 I snuck in some Cosmo Cricket red grid paper that coordinated so well with the scarecrow’s hat. I stamped the polka dots on the flowers, and had some blue checked brads in the shop that matched perfectly! A few buttons for the finishing touch. More of the red checked paper here. And a sassy print with the sparkly red shoes. I separated the two bold patterns with a slim black border. Otherwise it might make your eyes go buggy with all the patterns. 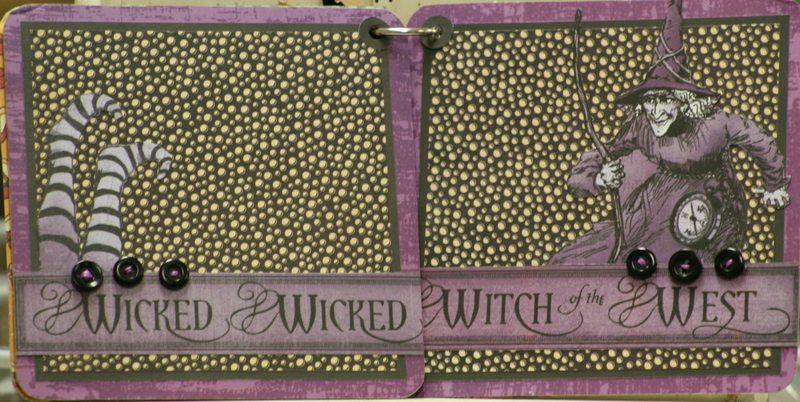 The good witch is accented by a nice blingy border strip, and some pretty poppies that I cut out and layered on. This set of pages was fun. I switched to purple as my base. 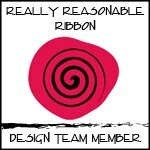 I have a nice cardstock line in the shop that gives the impression of a pattern…but is flat…so it’s easy to adhere. 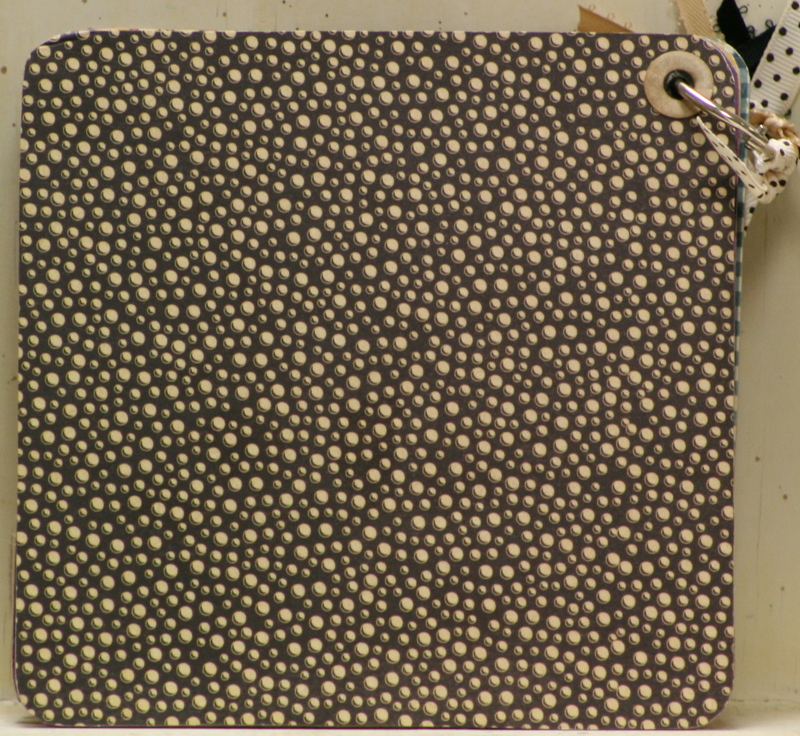 Not sure what to make of the black with white dots…will like it more when it’s covered with pictures. A little goes a long way!!! The wicked witch and curled up stockings just needed some buttons as accents since this page is so busy. I think I might have accidentally hypnotized myself putting the back cover on : ) Do not look directly at the paper!!!! Isn’t it fun getting into the holiday spirit???? 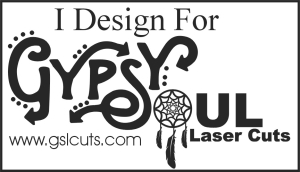 Get it…spirit…hahaha. 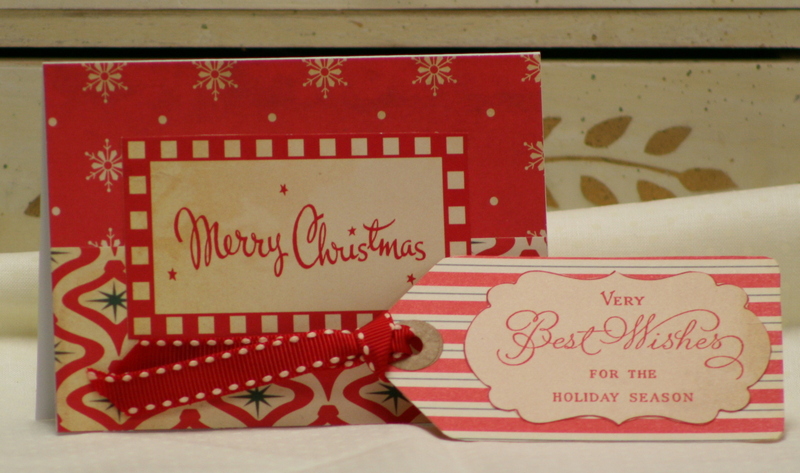 I made up these great cards Saturday with lot’s of paper patterns from Pink Paislee and Cosmo Cricket. 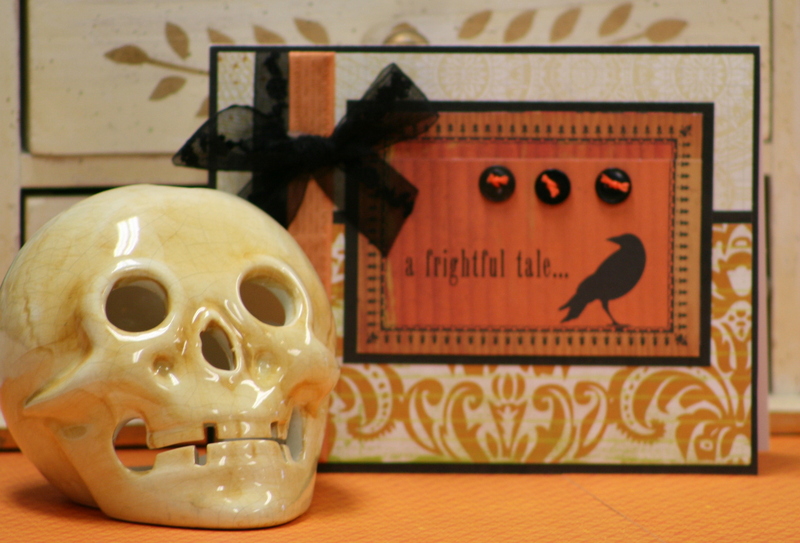 I love to mix and match the patterns : ) Of course I added buttons and layers of spooky black lace and orange ribbon. 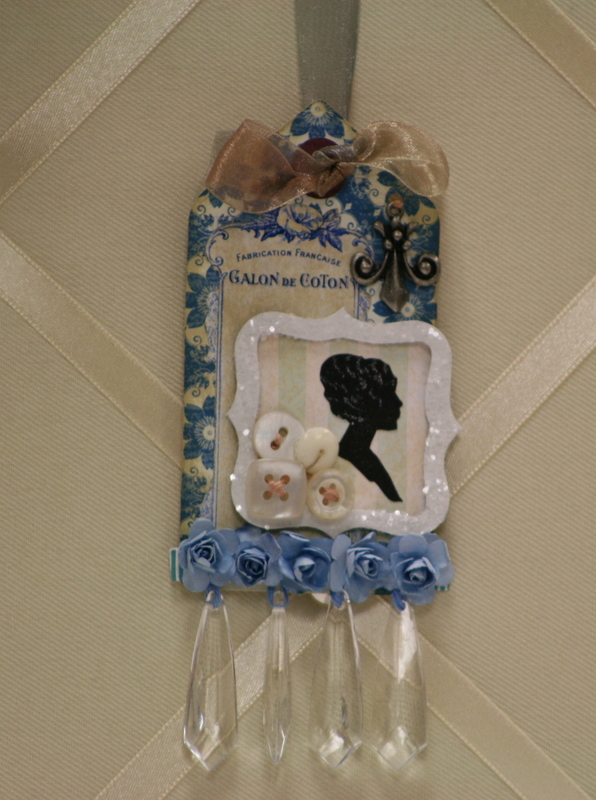 This one has a super spooky birdcage with crows!!! Batty Bats!!!! How scary can smiling bats be right???? 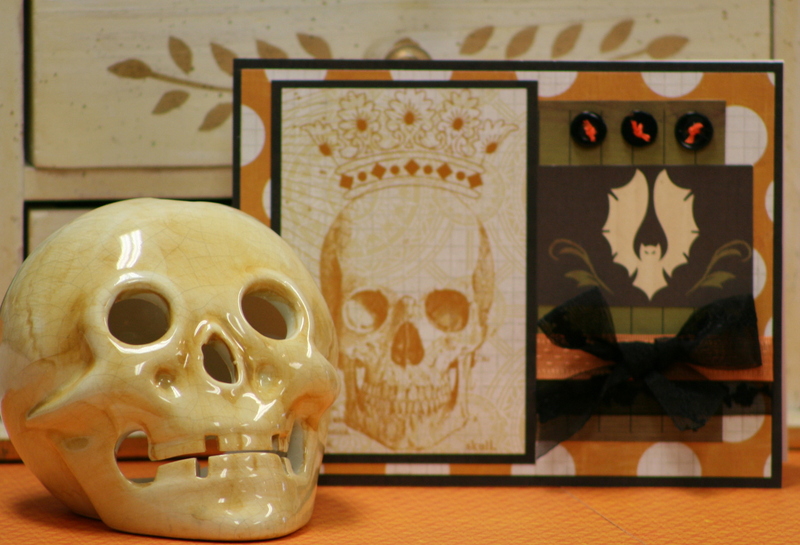 Skulls with crowns : ) The royal dead??? Last but not least….the raven….now that’s Halloweeny!!! 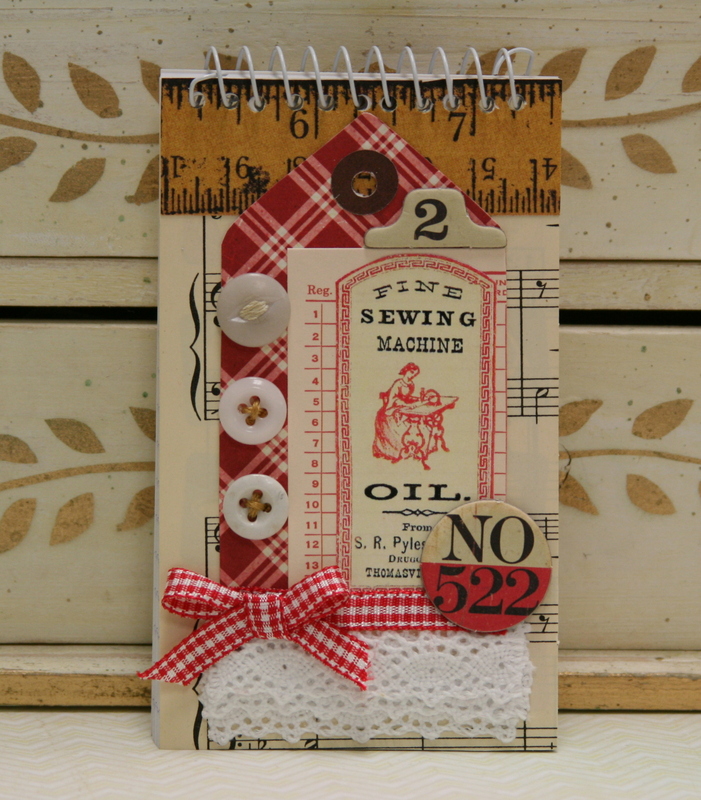 This card has lot’s of layers of pretty vintage inspired paper from Graphic 45. The sweet little girl image is of course from Graphics Fairy. I added lace and ribbon trim and buttons. 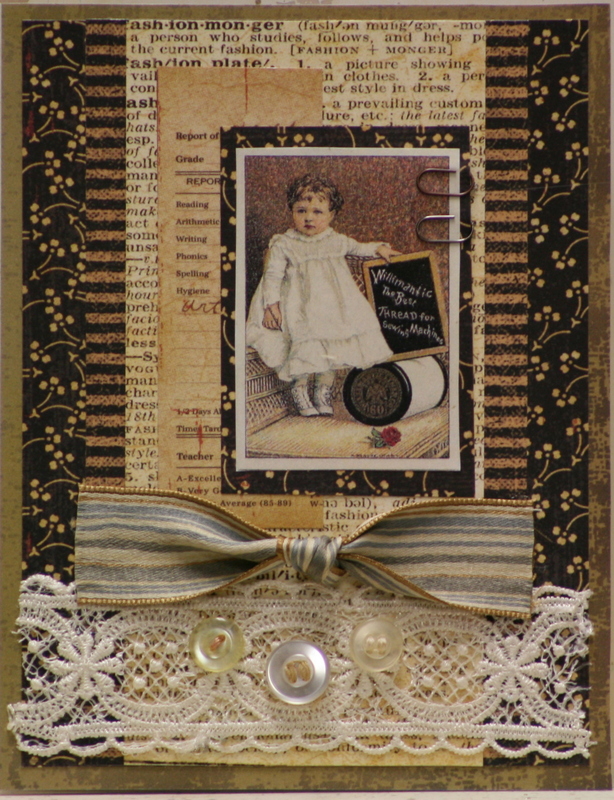 The final accent is the two tiny clips from Tim Holtz. I think they are retrolicious : ) P.S. I think I had a sweater back in the 80’s with that red snowflake print…lol.